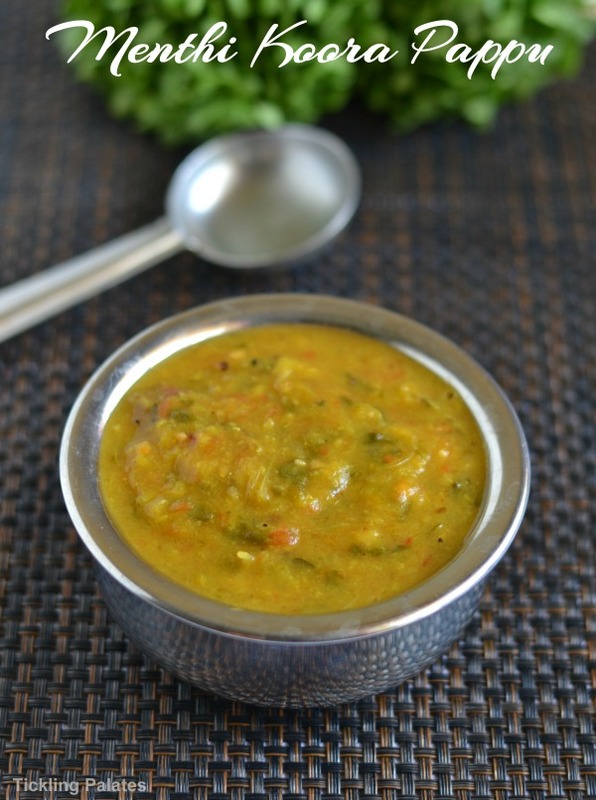 Methi Dal recipe or Menthi Koora Pappu is a staple dal recipe served as a side dish in India. It is made using fresh fenugreek leaves. It is called as Vendhaya Keerai in Tamil and Menthi Koora in Telegu. 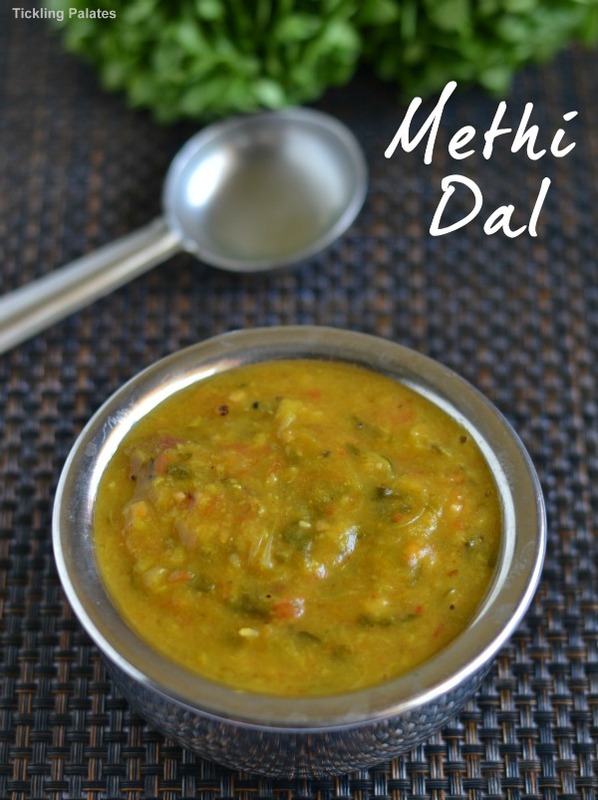 Methi dal is a thick, creamy and a very comforting dish which can be made several ways. My way of cooking it, gets done in one pot and its very quick and easy to make as well. When you follow this method, there is no fear of over cooking the dal and the bitterness of the fenugreek leaves steeping into the dal. Methi is a rich source of Iron and fibre and the more you include it in your diet the more you are helping yourself. The Fenugreek leaves are diabetic friendly and is known to be good to treat bad heart conditions and fluctuating blood sugar levels. It is also one of the easily grown greens in your garden. Even if you don’t have a sprawling garden, you can make use of any old containers to grow your own methi. The fresh leaves are a delight to use in dals. 1. I used yellow moong dal as it gives a sweet tinge to the dish compensating the bitterness of the methi leaves. 2. 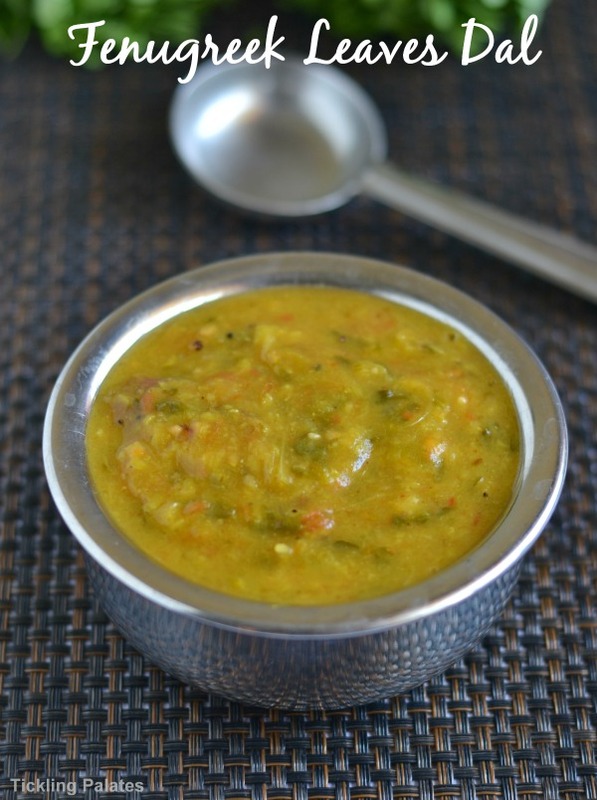 You can also use toor dal (pigeon peas) in its place or a mixture of both the dals as well. You can serve this dal with rice for lunch and also serve it as a side dish along with chapathis or rotis and both ways it tastes good. You can also try making this Murungai Keerai Poricha Kulambu and Gongurra Pappu which also happens to high in nutrients and happens to be filling at the same time. 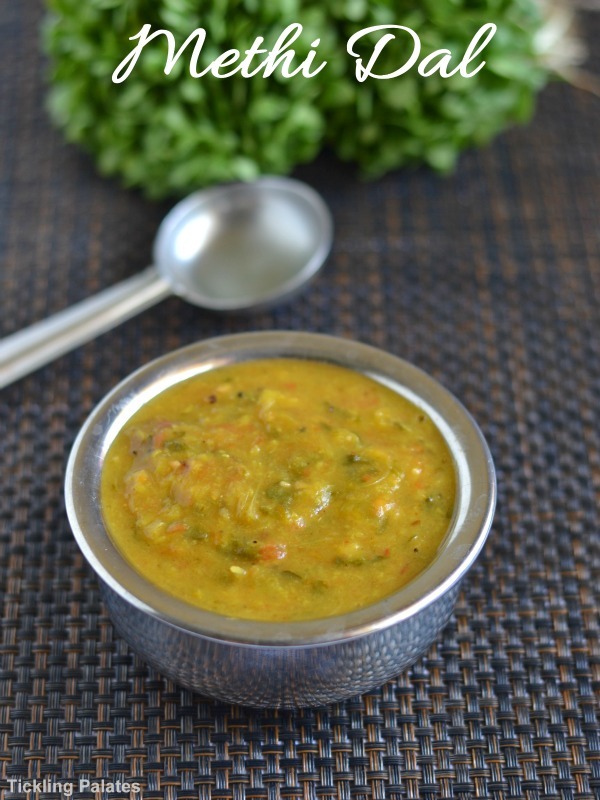 Methi Dal recipe or Menthi Koora Pappu that's served as a side dish with rice or chapathis. Trim the roots of the methi leaves bunch and immerse it in a big bowl of water. All the dirt will settle at the bottom of the bowl. Wash the leaves well and chop it roughly. Chop the onion, tomato and slit the green chilies. Take a pressure cooker. 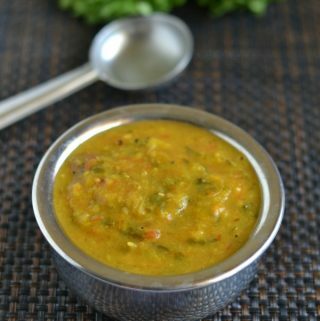 Add yellow moong dal, methi leaves, onion, tomato, garlic pods, green chilies, turmeric powder, 1/4 cup water and mix well. Pressure cook for 2 whistles and take off fire. Wait for the pressure to release. Meanwhile, heat a pan with oil. Add mustard seeds and let it splutter. Add urad dal, whole dry red chilies and roast for a few seconds. Transfer the seasoning to the pressure cooker, add salt and mix well. With a masher, mash everything together till the mixture becomes a pulp. I transferred everything to my “Keerai Chatti” and mashed it. If you do not have a masher, transfer the contents to a blender and using the whipper button pulse a few times at regular intervals. Do not grind to a paste. Methi Dal is ready. Transfer to a serving bowl. Serve hot with steaming rice or as a side dish to chapathis. I love dal for its simplicity , dammm good. Flavorful and comforting dal.. lovely presentation too! !